Despite the Joint Opposition (JO) of Sri Lanka Parliament is making an enormous ruckus from the day the Value Added Tax (VAT) problem emerged from the Yahapalana Budget, and subsequently making a hue and cry on the amended (VAT) Bill to the extent of invoking the wrath of gods on the current regime by dashing coconuts at Sri Maha Kali Amman Kovil in Modara, while some of their supporters visited the famous Seenigama Devale on the South-West coast in Hikkaduwa. Seenigama Devalaya, which is dedicated to the Devol Deviyo,(god Devol), is well known to protect the local fishermen in the area, who go fishing in the deep sea. Seemingly it has become popular for some people to visit it and make vows based on sinister activities for the sole purpose of cursing their enemies with vindictive and spiteful mindsets. Some people visit the devale to bring curses on a foe and the process is called Miris Ambaranna (to grind chilies). However, on the brighter side, several consumer items necessary for day-to-day living of the populace have been exempted from the amended bill, along with certain other areas such as health related issues, surgical services, transport, bakery products, life insurance and mobile phones. Traditions and sacraments in the Sri Lankan society go back over 2,500 years, coming down the generations. The culture, which is very much alive in the rural villages, has derived not from the teachings of orthodox Buddhism, but what is known as folk Buddhism, which is a fusion of Yakka and other primitive animism. The worship of various forms of gods takes place according to Hindu mythology. The goddesses, idols and devils have become the Sri Lankan conception. The dogmas were created by the fears ingrained initially in the local mentality from the time when Yakkhas held sway over the island, when the community harboured awesome fears with infectious diseases or natural catastrophes believed to be ascribed to the wrath of a variety of gods, who had to be pacified to achieve succor. Vijaya ignored her compassionate pleas and resolved to marry the Madhura princess of his own choice. Upon his betrayal, Kuveni scorned him with words of wrath and cursed Vijaya. “Vijaya should not have listened to his Purohitas (advisers), but to his own conscience and made the woman who helped him to win the throne of Lanka”, the fable goes on. Kuveni’s curse is believed to have gushed right down the royal lineage and has overflowed to each and every nook and corner of Sri Lanka over the decades. At first, Vijaya’s successor, Prince Panduvasudeva, was afflicted with an incurable, deadly disease and his illness was directly linked to Kuveni’s curse of Lanka in repudiation of Vijaya having had breached his oath. This was the time when Kohomba Kankariya, a thovil (ritual) was performed, to cure the King. 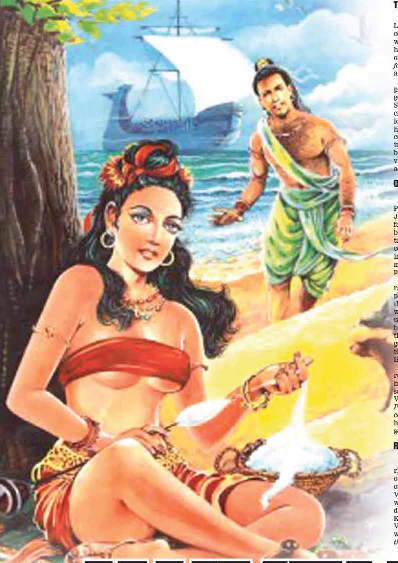 There are other fables in Sri Lanka to indicate that Gajaman Nona who killed her own son, born out of her first marriage, to satiate her husband’s murderous desires, was also the tragic episode of Mariakade Hamine is recorded as Kuveni being reincarnated as Mariakade Hamine in the 20th century, due to a man’s vengeance, thus brought forward the curse Kuveni scorned on Vijaya’s own betrayal to her. It is thus, assumed that the infidelity of Vijaya followed the inevitable curse not only on Vijaya, but the country as a whole and descendants of all Hela People alike. Therefore, the myth has been cemented in the theory that when Kuveni cursed Lanka and Vijaya, the curse has taken a firm root well and truly. This becomes clear when observing the behaviour of some of the modern parliamentarians in Sri Lanka, probably conforming and confirming the fact that there is no relief from the curse still. Evidently, why are Sri Lankans not united? Why are they always hell bent on doing harm to one-another, and at times racially and religiously instead of helping each other? Is it not because of such behaviour that a new word called Sanhidiyawa has come to play a major role in all political and social activities today? It is also mentioned in this manifested allegory that when Vijaya deserted Kuveni with her children, a leopard cub (tiger) took refuge on her lap at the time she cursed him. The emergence of the ‘Tiger’ movement of the LTTE was once regarded as an extension of Kuveni’s curse on Sri Lanka, which lasted for three decades. When Liberation Tigers of Tamil Eelam (LTTE) activities were at their peak, it was suggested by someone that the tiger cub that jumped onto Kuveni’s lap, followed by Dividosa (curse of the Tiger) was a direct result of Kuveni’s curse on Vijaya and the country. As such, no more Kohomba Kankariya type exorcism could expel the long seated effects of Kuveni’s curse that had befallen on the country in the form of LTTE terrorism and the only remedy to get rid of the curse would be to engage a modern type of an exorcist, in the form of a Defence Secretary, to perform a completely different type of thovil which, at long last, made Gotabaya Rajapaksa as the modern-day exorcist who performed a successful thovil, with the help of the three armed forces and eradicated the curse on 19 May 2009 by declaring that “The war with Tamil Tigers was over and the Sri Lankan Army had managed to kill the chief of the LTTE Velupillai Prabhakaran”. Once the terrorist war was won and Sri Lanka became the cynosure of the world for eliminating a ruthless terrorist war, which no other country could achieve such a success over terrorism, the Army Commander, who fought terrorism and executed his military strategies to win the war had to be incarcerated and confined to a prison ‘uniform’ and treated far less than a human inside a tiny room with open drain infested with rats running the perimeter of the room, risking rabies while sleeping on the floor. If this was not part of Kuveni’s curse, what else could it be? Many regarded such inhumane actions by the previous regime as Kuveni’s curse being compounded and extended further. Satan certainly seemed to have won the spiritual battle as evil effects were to become infectious when the ruling elites of the previous regime enjoyed super luxury lives while the common folk were blinded by slogans of “winning the war” and vilifying more and more with debauched activities of corruption and manipulating their power in the belief that there is no tomorrow or another world. On 8 January 2015 another miracle took place where people were made to believe that at long last it was the end of Kuveni’s curse and peace and prosperity, devoid of corruption and clean living, would pave the way for a better tomorrow. A mixture of two political parties formed a new union what was known as Yahapalanaya (good governance) with the sole aim of a better and a cleaner political climate in the country. Alas! people have been made despondent over and over again where a bag of spoilt eggs in the combined basket appear to be doing a repetition, which some say, even go far beyond their predecessors. The whole scenario has turned into a big issue, where melodrama of big wigs of the previous regime, including the some of members of the Forces, who fought the war, including the Defence Secretary, are being called to appear before the FCID and various other commissions on various allegations. Some even suggest that it could be even retribution boomeranging on some who held authoritative positions and abused their power and force, which is a continuation of the Kuveni’s curse. Whether it is Kuveni’s curse or Satan playing havoc, Sri Lanka is certainly heading towards a gloomy and uncertain area. Today, even those elected as politicians to serve the public have forgotten why they have been elected. Their main ambition appears to be seeking only a luxurious type lifestyle. The very politicians who went to the extent of dashing coconuts at Maha Kali Kovils were deaf and dumb when Parliament discussed granting of duty free cars to the lot. They would not utter a word when their pay increases were discussed in Parliament (except the odd MP who genuinely thought about the country and people); they seem to be more worried about the colour of the microphones inside Parliament and want those to be changed to go with the interior décor. But they fail to think about the voter who sent them to the august assembly. The latest being they want to go for digital TVs inside Parliament, which of course is going to cost a lot of money and perhaps commissions to someone’s pocket. Why on earth, all these at extra expense out of the poor populace in the country? Many politicians seem to have lost their direction today without any religion. One day they end up in a Kovil, on another day in a Temple with a tray of flowers. After all, none of these religious abodes function or aid for the sake of politicians! Unless it is to escape from their own guilty conscience. As many people have suggested before the Budget Bill reading, about dashing coconuts to invoke the wrath of gods and devils, it certainly would have been a waste of time and resources. Everybody knows that coconuts are expensive in the market. As someone suggested they could have had some delicious pol sambol instead of wasting time and money in that manner. After all, looking at what goes on politically in Sri Lanka one could say at present we are in a real mess. Let us understand our problem is the Indian Empire and Indian colonial parasites.